Now we are going to step into the world of ICs (integrated circuits). In this circuit, you’ll learn all about using a shift register (also called a serial-to-parallel converter). 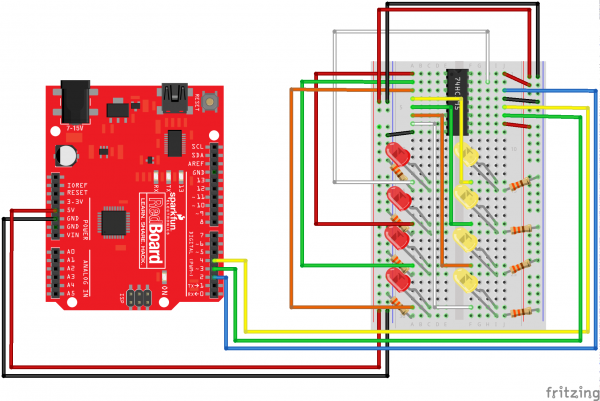 The shift register will give your RedBoard or Arduino Uno R3 an additional eight outputs, using only three pins on your board. 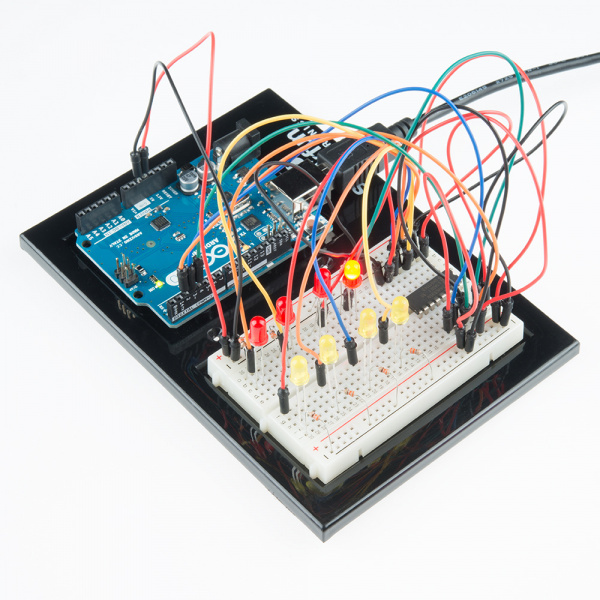 For this circuit, you’ll practice by using the shift register to control eight LEDs. For the shift register, align notch on top, in-between “e1” and “f1” on the breadboard. The notch indicates where pin 1 is. Open Up the Arduino IDE software on your computer. 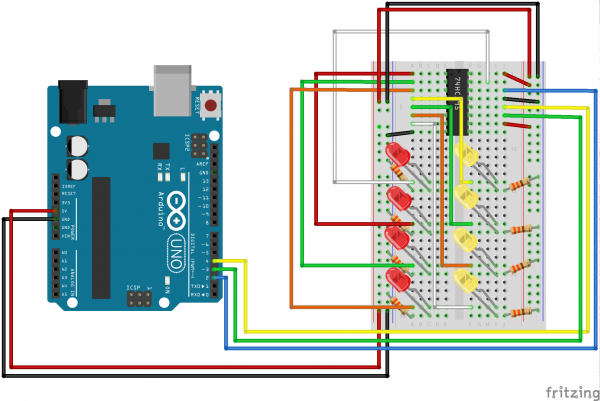 Coding in the Arduino language will control your circuit. Open the code for Circuit 14 by accessing the “SIK Guide Code” you downloaded and placed into your “Examples” folder earlier. to perform many useful functions. shiftIn() and shiftOut() to access these parts. Plug in the chip so it bridges the center "canyon"
of each resistor to GND. // disable them from running. // HIGH or LOW in exactly the same way that you use digitalWrite(). // is also eight bits, we'll use a byte (which we named "data"
// at the top of this sketch) to send data to the shift register. // is "0", the output will be LOW. // individual bits in a number 1 or 0. // Now we'll actually send that data to the shift register. // the latchPin, which will signal the shift register to "latch"
This function will step through the LEDs, lighting one at at time. // for tips on how to make random() more random. 1 if you use that contribution, and 0 if you don't. // Add one to data, and repeat! You'll communicate with the shift register (and a lot of other parts) using an interface called SPI, or Serial Peripheral Interface. 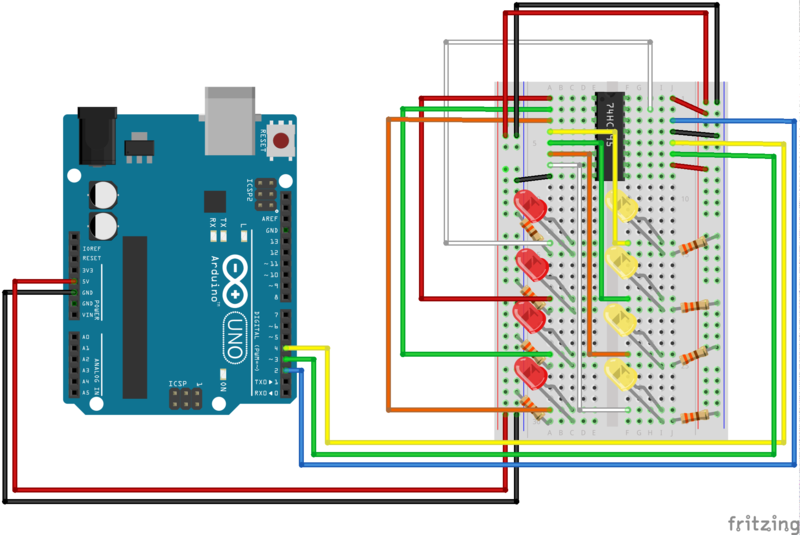 This interface uses a data line and a separate clock line that work together to move data in or out of the Arduino at high speed. The MSBFIRST parameter specifies the order in which to send the individual bits, in this case we're sending the Most Significant Bit first. Bits are the smallest possible piece of memory in a computer; each one can store either a "1" or a "0". Larger numbers are stored as arrays of bits. Sometimes we want to manipulate these bits directly, for example now when we're sending eight bits to the shift register and we want to make them 1 or 0 to turn the LEDs on or off. The Arduino has several commands, such as bitWrite(), that make this easy to do. You should see the LEDs light up similarly to experiment 4 (but this time, you're using a shift register). If they aren't, make sure you have assembled the circuit correctly and verified and uploaded the code to your board. See the troubleshooting section. 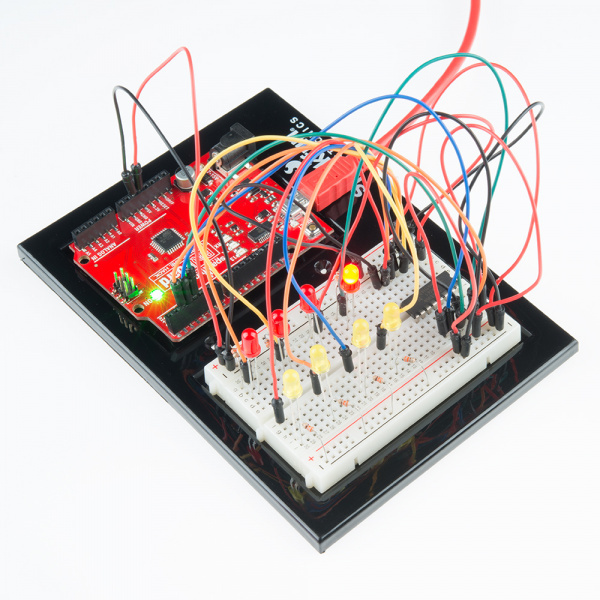 Similar to experiment 4, a scrolling marquee display delivers a message with multiple LEDs. Essentially the same task the shift register achieves here in experiment 14. This happened to us a couple of times, it happens when the chip is inserted backward. If you fix it quickly nothing will break. Sorry to sound like a broken record but it is probably something as simple as a crossed wire.